Happy Friday! I hope you've had a great week! Yesterday, I was able to get my hair cut and colored. I always feel like a new woman when I get my hair done! I'll be sharing more about my hair and what's currently on rotation in my beauty bag here on the blog next. 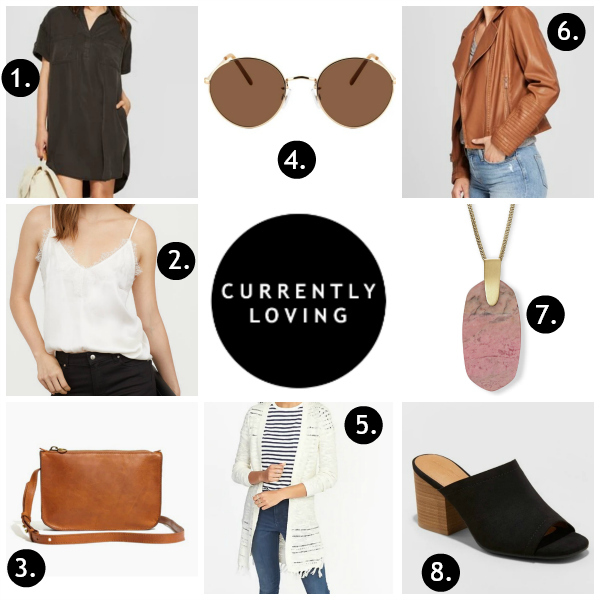 For today, I'm sharing my weekly roundup of what I'm currently loving. Last I mentioned last week, all of my current purchases are items that I can wear now at the end of summer and when fall weather comes. Also, I always try to purchase clothing and accessories that work together, which is why I absolutely love neutrals! 1. D R E S S | A black dress is the most important piece in your closet. It's a staple! You can dress it up or down and it can always be your go-to when you don't know what to wear. I love this dress from Target so much! It would look so cute with sneakers or ankle boots. 2. C A M I | I have a super similar cami in black that I have been wearing non-stop so I'm thinking I would also get a lot of use out of a white one. I love how it looks layered! 3. B A G | Besides shoes, bags are the second thing that I personally invest in. I also don't really purchase "trendy" bags because I want something that I classic. I love a good saddle brown leather bag like this one. This bag will last forever! 4. S U N G L A S S E S | I am currently loving round sunglasses! I had my eye on a pair that was just not in my price range. I lose or break sunglasses way too often to spend a crazy amount of money on them. I found this great budget friendly pair and I'm excited to try them out! 5. C A R D I G A N | Old Navy always has such great cardigans and I love this fringe one! It would be so cute paired with that white cami and a denim mini skirt. I love it! 6. J A C K E T | I have been hunting for a brown faux leather jacket and I think this is the one! It's under $40 and so cute. I think I would get a lot of use out of this during the fall and winter. 7. N E C K L A C E | Have y'all seen the new Kendra Scott fall collection?! It's so good! I love so many of the pieces but this necklace is my favorite! 8. M U L E S | I think mules are the perfect transitional shoe to take you from summer to fall. I love this super affordable pair! They would be great with a dress or shorts or jeans or anything.